been carefully selected for comfort and safety. wherever they are in dark or water. fit. With a D- Ring on the Vest, you can match a harness. 4:Perfect for all your boating, sailing, fishing and water sport adventures with your pet. 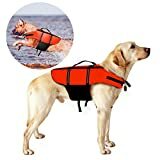 Ideal for active water-loving dogs. pet precisely with a flexible tape measure to ensure the best fit. And also have the place to install the dog leash when you walk the seaside with dog. HIGH QUALITY MATERIAL AND SAFE – Made of Polyester Oxford & Nylon Fabric, Mesh Fabric, Pearl Cotton Foam. The whole material is lightweight, breathable, machine-washable fabric. 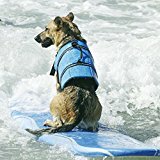 Ensure the safety of your pet in the sea. 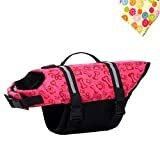 STRONG BRIGHT CONTRAST COLOR AND REFLECTIVE TRIM – Reflective accents and reflective strips for maximum visibility.which make you focus on your pet eazily in the water while swimming. VERY EASY TO PUT ON AND TAKE OFF – Hook-and-loop fasteners make adjusting for gentle pressure a snap for most any size dog Drug free and comfortable for your pet.